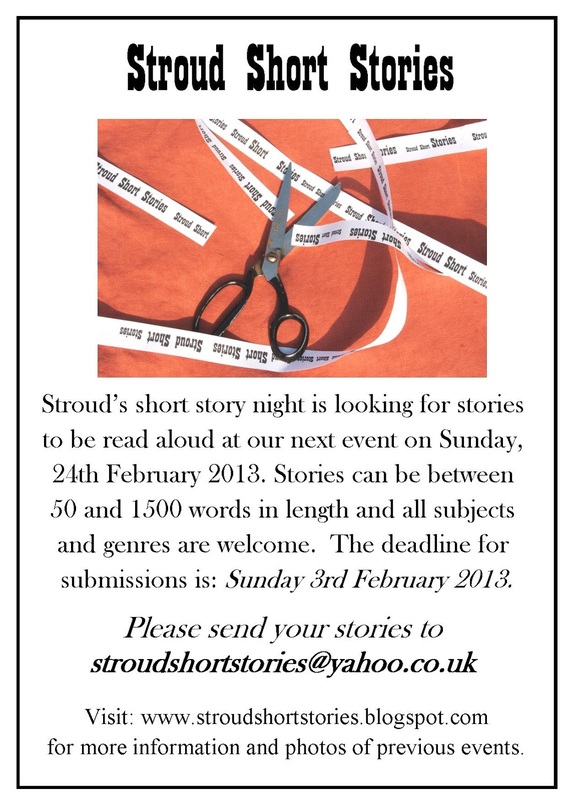 Stroud Short Stories is back on Sunday 24th February 2013 and we are now looking for short stories to be read aloud by their authors at this event. Stories are welcome on any subject and in any genre but must be between 50 and 1500 words long. The deadline for submissions is Sunday 3rd February, 2013. 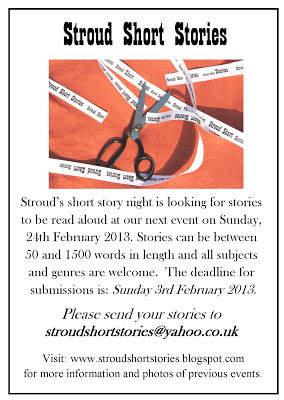 Please send your stories to stroudshortstories@yahoo.co.uk (a maximum of three stories per author, please). 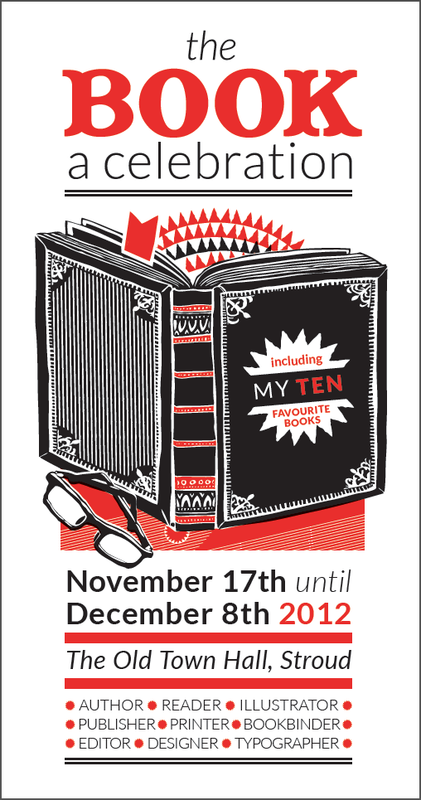 The Book: A Celebration’s exhibition of 50 Stroud residents’ 10 favourite books is now on at the Old Town Hall in Stroud and is well worth a visit. Essentially, it’s like nosing around 50 different people’s bookshelves, but all in one room, and with a very illuminating catalogue to hand too. It’s full of interesting insights into books and people! Lunchtime talks have been organised for each day of the three weeks that the exhibition is on. I will be there on Monday 26th November along with three Stroud Short Stories authors (Andrew Stevenson, Esmé Lloyd-Baldwin and John Holland). I will give a brief introductory talk about the short story (and my particular favourite short story, Carson McCullers’ “A Tree, A Rock, A Cloud”), and will be followed by each author reading a short story of their own, ending with a discussion. Please do come along if you’re free. The talk starts at 1pm, and lasts for an hour. There is a full list of lunchtime talks here. Stroud Short Stories' "Spooky Night" took place on Sunday 28th October in the newly refurbished SVA and was as spine-chilling as promised. As well as ballroom dancers from beyond the grave, dogs with a taste for a human flesh and something nasty dripping down from the attic, psychopathic dolls and terrifying apparitions in the Farmer's Market were also in evidence! Many thanks to all who came and formed such an appreciative audience, and a big thank you to all the readers, who once again went the extra mile in bringing their creepy stories to life. Pam Keevil reading "Beginners Welcome"
Andrew Stevenson reading "Repeat After Me"
Eleanor Holliday reading "Sea Urchin"
John Holland reading "The Uncanny Valley"
Peter Adams reading "Going to the Dogs"
Bill Jones reading "The Vampires in the Basement"
Stephanie Smith reading "The Stonemason"
Teresa Moorey reading "Food for the Spirit"
The next event will be in February 2013. (Please watch this space for details). We are now open for submissions for the February event. Stories on the theme of that Many-Splendoured Thing (Love, that is) are particularly welcome, as I am planning once again to have a lively Valentine's theme. Stories can be sent to stroudshortstories@yahoo.co.uk (Stories should be under 1500 words, with a maximum of three submissions per author. As usual, authors selected for the most recent event are asked to skip the next event before submitting again). Here's a link to Stroud Short Stories on BBC Radio Gloucestershire this afternoon, with three authors reading excerpts from their creepy tales, and me chatting with Claire Carter about the forthcoming event. (Katherine Mitchell reading from "Listen", 12 mins in, John Holland reading from "The Uncanny Valley" at 1 hr 15 mins, followed by Bill Jones chatting about the forthcoming event with Claire Carter, and Andrew Stevenson reading from "Repeat After Me" at 2hrs 20 mins.) It'll send shivers down your spine! Stroud Short Stories’ “Spooky Night” is going to be featured on Claire Carter’s show on BBC Radio Gloucestershire this Friday, 26th October. Tune in around half past three to hear organiser Bill Jones as a live studio guest, with recorded excerpts of four of our authors (Katherine Mitchell, Andrew Stevenson, John Holland and Teresa Moorey) reading tasters from the stories they will read on the night! Guaranteed to raise a pre-Halloween frisson!